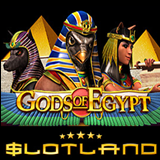 I'm loving Slotland's new real money online slot game, Gods of Egypt!!! I got a "sticky wild" on my second spin, which stuck until I won $900 on a $62 bet. Then I got 3 scatters which started the bonus round where I won over $3400!!! Gods of Egypt is a five-reel, 31 payline game with a “pick me” bonus game built into it. Players can bet as little as $.05 or up to $2 per line. The jackal god of funerals, Anubis, is the Scatter. Three or more Scatters trigger a bonus round with a pick me bonus feature where players select objects in the pharaoh’s tomb to reveal bonus prizes. Ra, the first pharaoh and god of the sun, is Slotland’s first “sticky” wild. It expands to cover the entire reel it appears on and then stays there until you spin a winning combo! How great is that?! Gods of Egypt caps of a month of sixteenth birthday celebrations at Slotland. After a series of birthday casino bonuses throughout the month, the unique online casino is adding up to 45% to all deposits until Sunday, and has also given registered players free chips up to $45. Gods of Egypt is tied to Slotland’s site-wide progressive jackpot which, unlike most other casino’s jackpots which never seem to be won, is hit several times a year, usually for $150,000 or so. Five Bar symbols with a minimum $20 bet wins the jackpot which is currently approaching $200,000. Slotland creates all of its own games so, like the 33 other games now available, it will only be found at Slotland.eu. Play it on your desktop computer, phone or tablet.